B: David Gibson: What Was He Thinking? 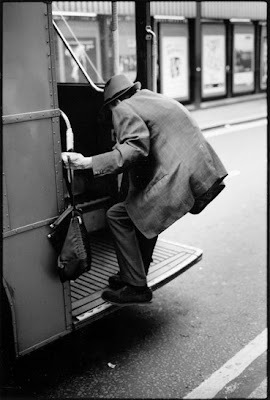 "I went to Dublin in 2000 for a week with the sole purpose of taking Street photographs. Trips like this (away from London) are quite rare for me and I went in a very determined mood. I have great faith in the equation that pounding the streets over several days usually rewards me with something of value. 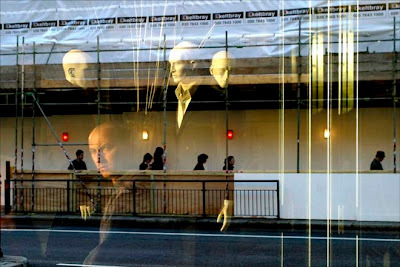 My basic philosophy on taking Street photographs has always been about looking for the luck. 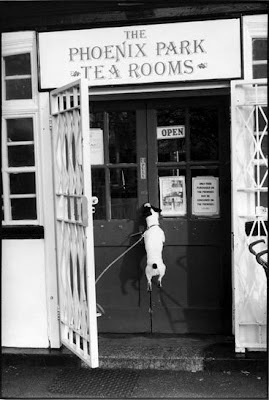 I was heading for Dublin Zoo in Phoenix Park and came across this scene where the owner had gone into the café and the dog was desperately leaping up and down. I love the way that there’s (hopefully) a double take with the dog frozen in mid air." 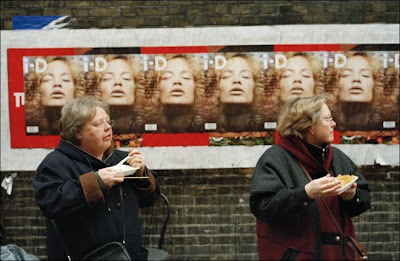 "This photograph taken in London in 1999 is quite different in how it came to life. I occasionally revisit my black and white contact sheets, which go back to around 1990 in the hope of unearthing a lost gem. The seam has been largely exhausted but I found this one a few years after it was taken. I find it interesting to look at old contact sheets with a fresh eye. This was certainly a grabbed shot, taken very quickly. It looks as if it were taken some time ago – it could be the 1960’s looking at the way the man is dressed - and the Routemaster bus. The demise of the Routemaster bus in London has instantly dated countless photographs." "This is a worked image where I have come across a scene and waited for the right element to wander into the picture. This is a common ‘technique’ that I employ where one half of the image is already in place. The stage is set but it requires something else, usually a person to lift it. This is again about looking for the luck but it is also about having an awareness / expectation of what could happen." 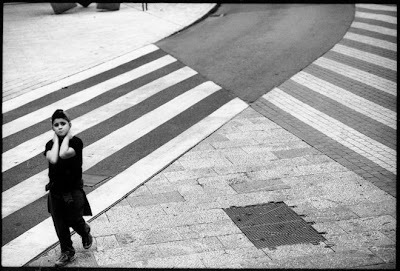 "The crossroads was in Palma, Majorca, which was another wonderful opportunity to seek out Street photographs. I was on holiday this time but my curiosity – and sense of responsibility – always prevailed. A phrase I heard Willy Ronis once state at a talk in London has always stayed with me – “the fear of missing”. I got a little above the scene which is something I often do. Maybe it’s a ‘decisive moment’; it’s certainly one of my best photographs." "I feel a slight frustration with this photograph because it’s not quite right. Crucially it’s not sharp enough as the light was going. 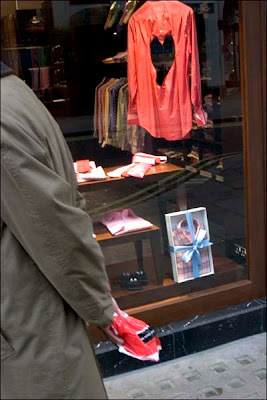 It was a grabbed / panic shot taken in London’s Chinatown. The luck is there – the posters in the background and then amazingly real twins but it’s still not quite right. It’s just not tidy enough." "An on-going project I pursue is hearts – I collect hearts. 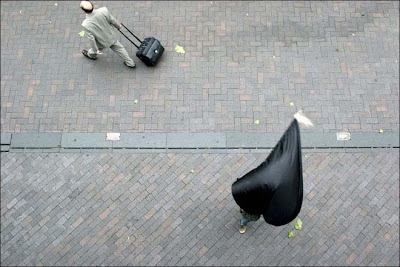 When I took this though I was just intrigued by this scene of a street performer whirling this flag. It was again taken from above which often offers something different and it’s also easier to shoot without being seen. It was only afterwards going through the sequence that I noticed the heart-shaped flag. That’s one of the delights of Street Photography…there is the feeling of occasionally hitting the target at the time but also there’s a delight of seeing something when you look through the images later on. I shoot digitally but I still have that contact sheet mentality. I like to wait a little." "This is another from the series, which I call ‘Stolen Heart’. I often give my photos a title because it identifies them more easily in my head but it also somehow solidifies the outcome. This is a subtle photograph and maybe a little too clever because it sometimes needs explaining. If a photograph needs explaining then it arguably doesn’t work. But for me it seems so obvious – the heart has been ripped from the shirt and the man is slyly taking it away! My own warped vision quite possibly. Maybe that’s what it’s all about…a slightly odd take on the world around me."